The “WestendDuo” is centrally located in a first-class site in Westend. Frankfurt’s Westend district enchants the visitor with a mix of business, services and high-quality living. With the greatest proportion of green spaces in the inner city, it promises sustainable working quality. Law partnerships, advertising agencies, insurance companies and banks, as well as galleries, popular restaurants and exclusive bistros shape the face of the district. Bockenheimer Landstrasse is among the premium office locations in the city. 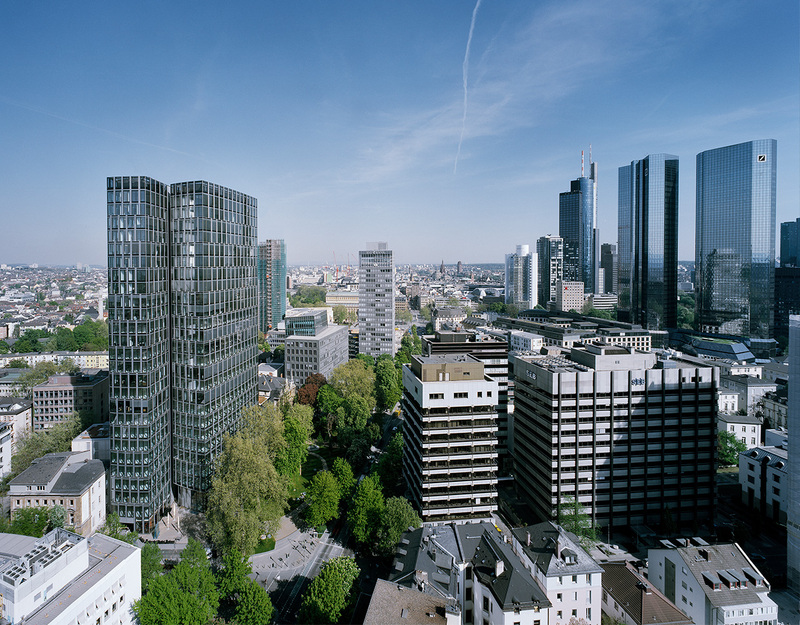 It is directly adjacent to the banking district – among other things the Deutsche Bank towers – and the city centre with its shopping streets, Goethestrasse and Zeil. Similarly, the famous Opernplatz square with its concert hall, the “Alte Oper” can be reached within just minutes. A number of S-bahn and U-bahn lines guarantee outstanding connection to public transport and Frankfurt’s main railway station. The journey to Frankfurt Airport, located around 20 kilometres away, takes less than half an hour. Those who work here can ideally avail of the diversity of the city to suit their own tastes, from a strategically well-placed location. The site, the fittings and the charisma of a building testify to visible success and are therefore decisive factors when it comes to choosing a company’s location. In addition to representative areas, WestendDuo also makes a convincing impact with its charm and a congenial mix in the parts open to the public. Frankfurt has a charm of its own. Those living here enjoy life in Europe’s smallest metropolis. The city centre is a vibrant area for strolling and relaxing, the Main river an artery running through the city. At the same time, every area downtown offers high-quality living. All the major points in the city can be reached quickly on foot, by bike or using public transport. The city fathers are innovatively planning the way to the Green City, with quality of life writ large in the financial metropolis.